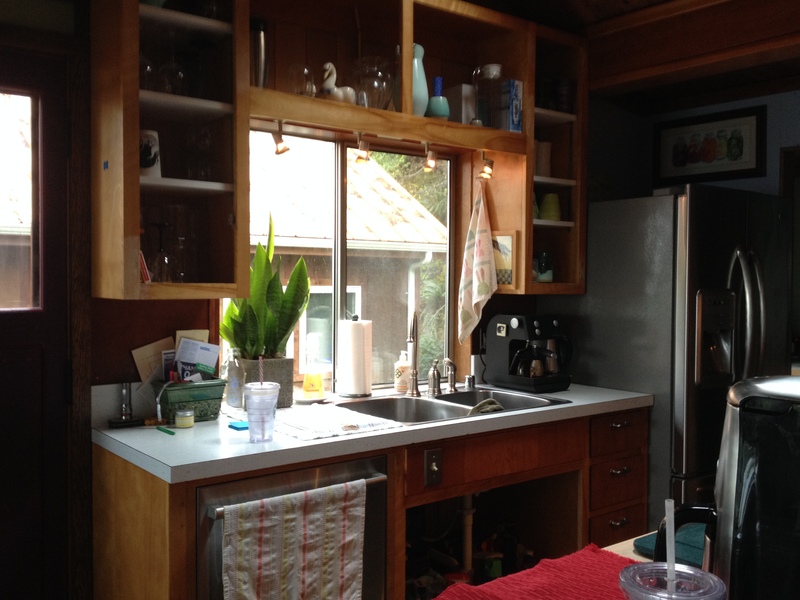 The cabinets directly under the sink have recessed doors, so you can comfortably stand at the sink all day long washing dishes or doing laundry or performing whatever task Island Life has in mind for you, and there’s plenty of room for your knees and shins and feet. However, the new kitchen sink that we selected is too big to allow for this recess. There won’t be enough room to install it unless the cabinet doors are made flush with the front surface. That’s where I come in. The Cabinet Butcher. I can take that recessed frame and reconstruct it so that the doors are flush and there is room for the sink, at the obvious expense of one’s comfort while standing there doing dishes. Since that’s usually me, well, who cares if I’m inconvenienced. We have a new sink to install, after all. 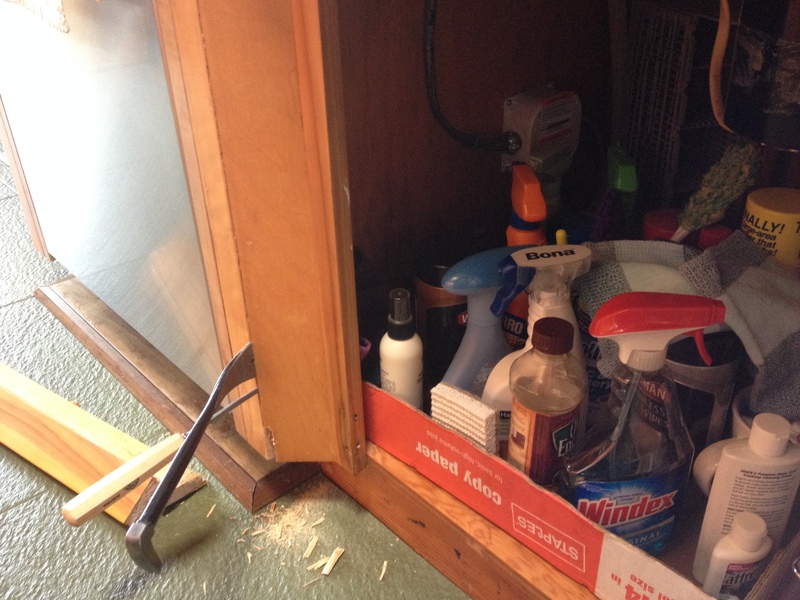 Now, the new configuration of the cabinet doors down there makes the opening wider, by a total of six inches. So, we need a strip of wood 6″ x 24″ to put in there between the doors. 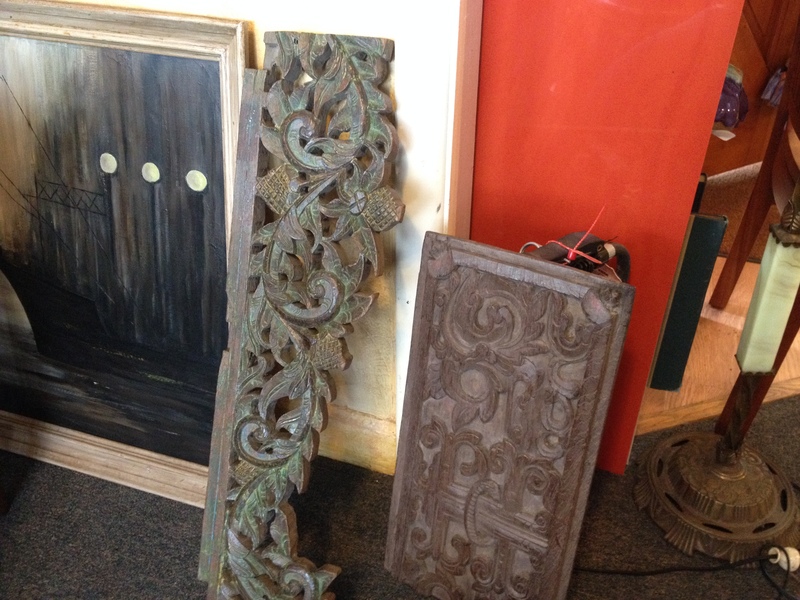 This is a pretty good opportunity to go down to a salvage store and find some odd scrap of carved wood that I can integrate into the cabinetry! “Pick me!” squealed these two pieces. No, you’re both the wrong size, and you’re both ugly. “Pick me! Pick me!” Okay, you’re the correct size but you’re still ugly. No dice. I’ll keep looking. 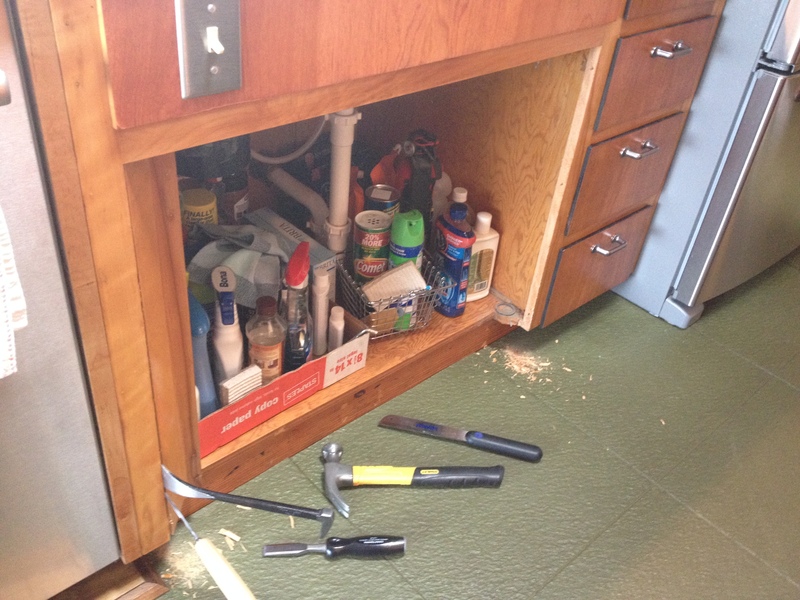 Yeah, well, while I ponder my newest conundrum, I must pry the remaining cabinet doors off their hinges so I can replace the hinges (with less-ugly hinges) and resurface them and stain them and make them pretty. I did replace all the cabinet shelves with melamine. 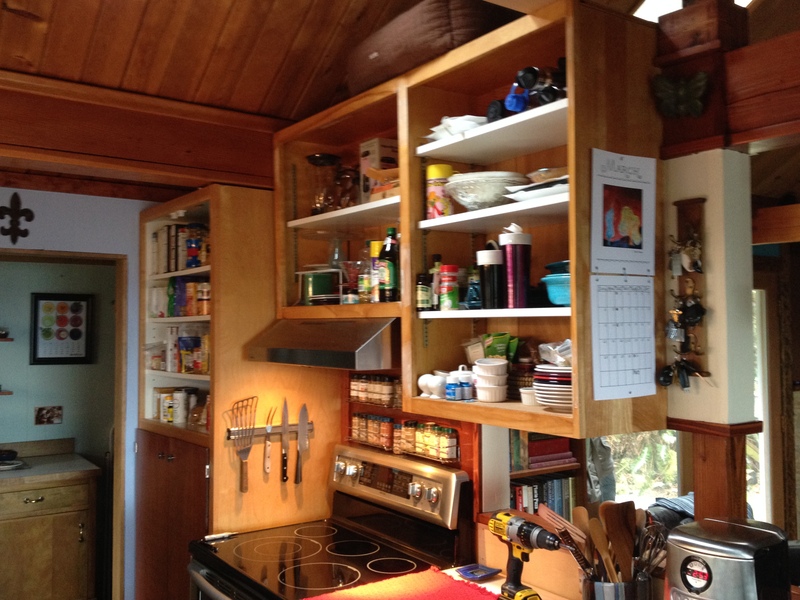 I’m no fan of melamine, but I am a fan of sanitary kitchens, and the melamine shelves were far cleaner than the greasy, sticky, cigarette-smoke infused cabinet shelves that we had. Aprupt change of topics, but Inky is a mountain climber. 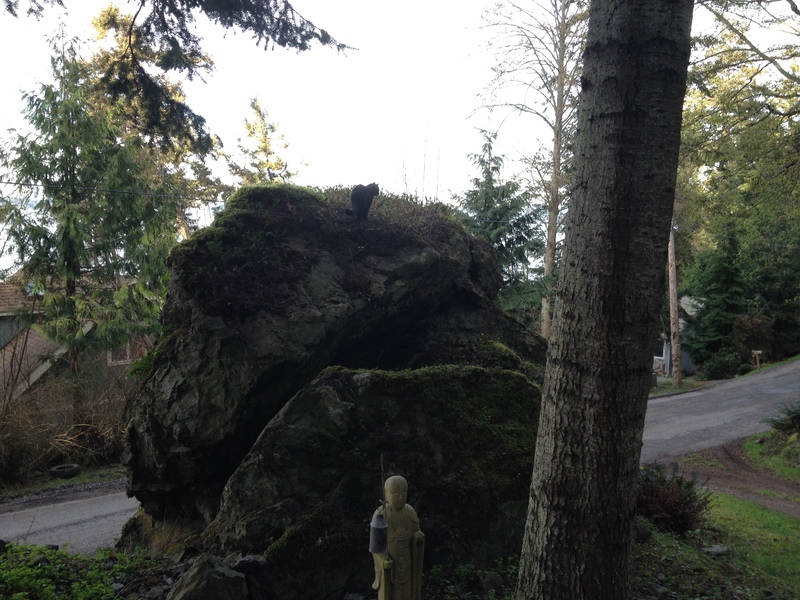 Here she is atop a rock that’s about 30′ above the road below. 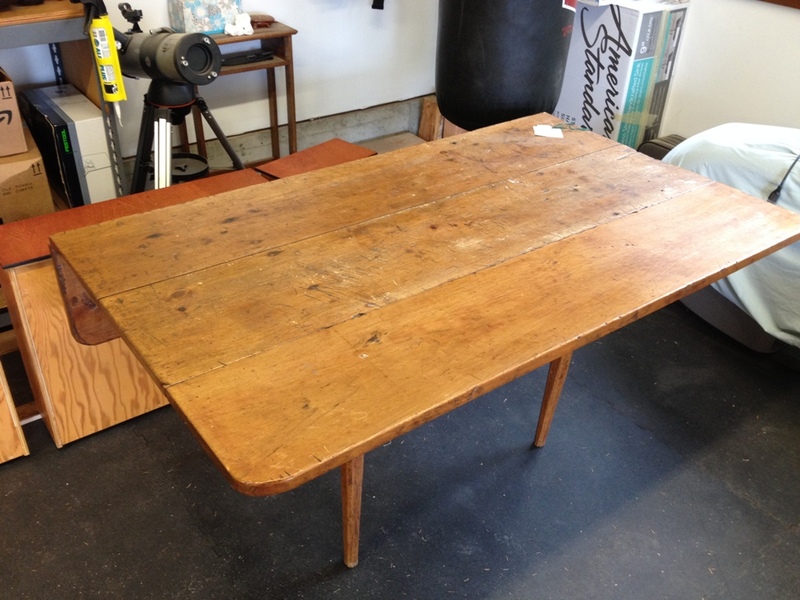 We found an old dropleaf farm table at an antique store. It is rumored to be from Ireland. Or made by someone from Ireland. 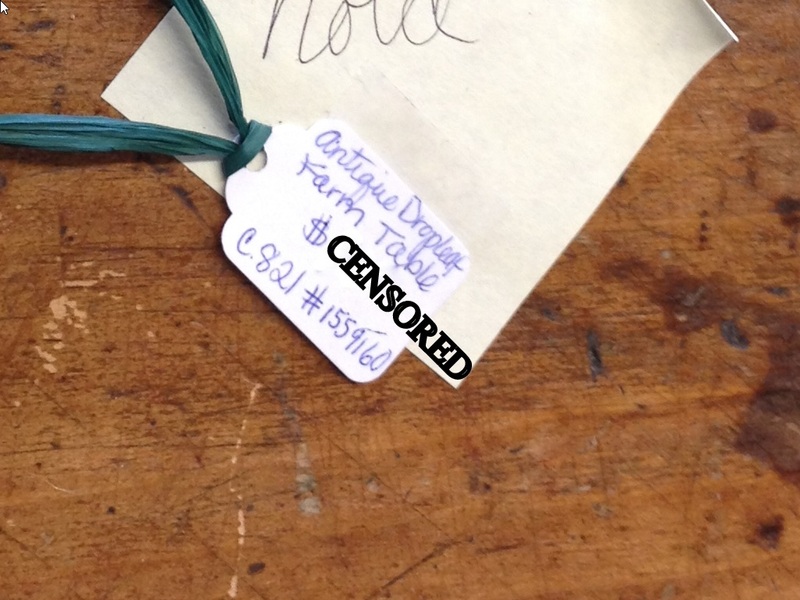 Or owned by someone who drank a lot of Bushmills. Anyway, we saw it and we had to have it. 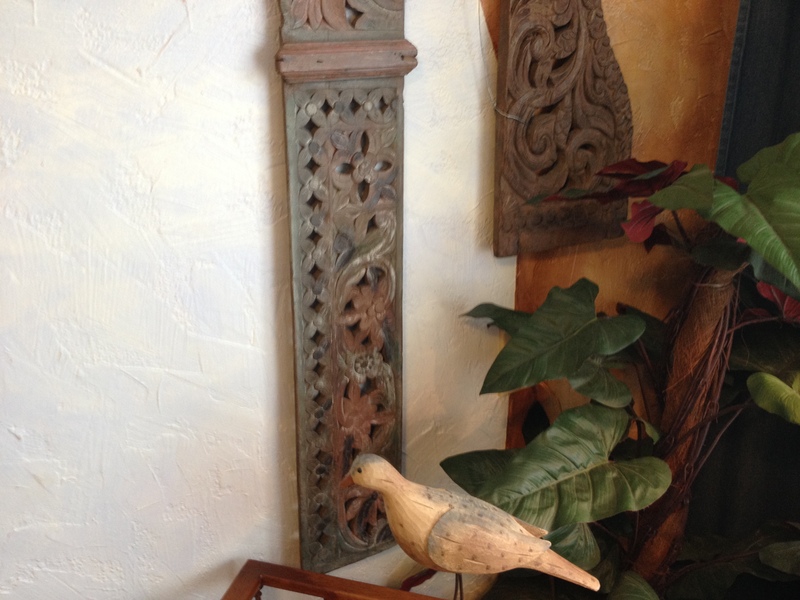 Antique wood furniture can teach us a lot about woodworking. You can see exactly how things were made, and more importantly, how these techniques stood up to the test of time and use. What worked, and what didn’t. In this case, it has taught me that we have been doing everything wrong. We spend so much time making sure everything is straight and flat, that table legs are plumb and solid, that pieces join at right angles. 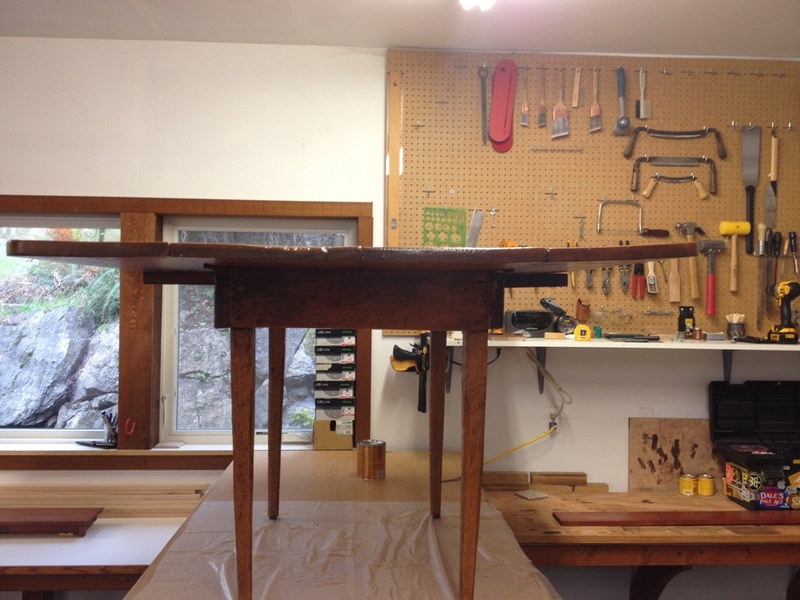 We cut tenons and mortises and dovetails, wasting precious time in a useless endeavor. We buy expensive table saw fences for accurate cuts, but there is no reason for them. You see, all you need to do is split some lumber with an ax and nail it together with some tenpenny nails, and you’re done. That’s it. Why make sure your table is flat? It doesn’t need to be. 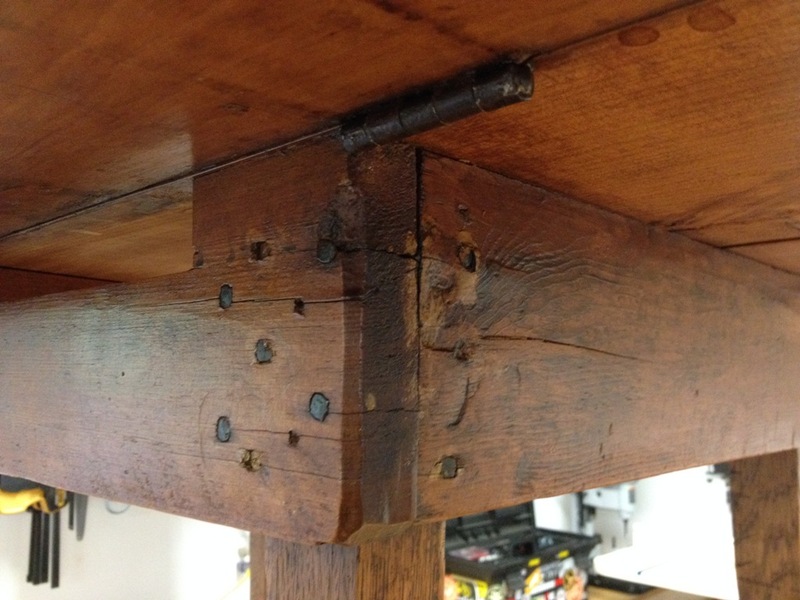 And is mortise and tenon joinery really superior to a few clipped-head steel nails? 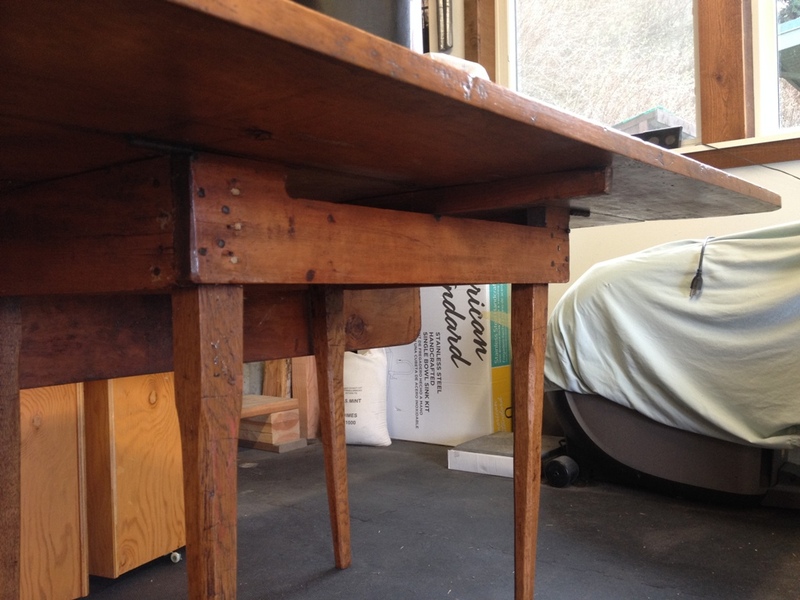 This table is like a hundred years old, and it’s still getting used. Should you protect the surface from burning pots and pans? What the heck would you do that for? Just set the frying pan right down on the table, the wood will absorb the heat. No biggie. And if the legs get loose, just twist those screws a turn or so to tighten them. And there’s always room for more nails, just pound them in! 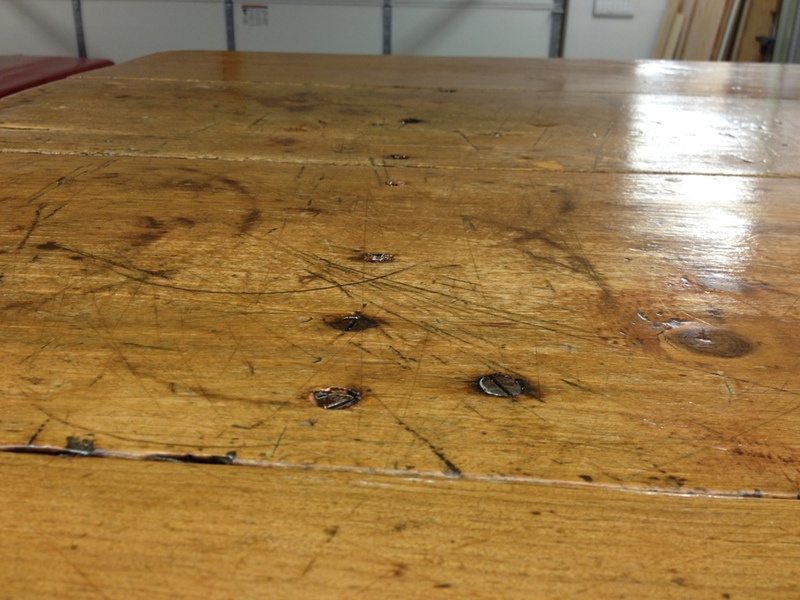 And don’t bother finishing it to a nice flat even surface, when the pens of children doing homework will simply indent the table top with a strange cuneiform. 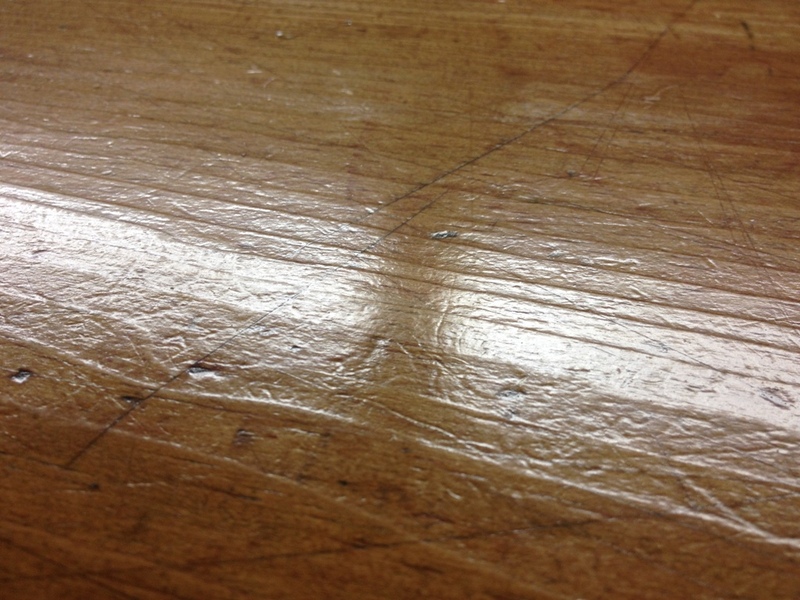 This table is riddled with overlapping pen strokes, and it adds to the character. In fact, I think it even inflated the price a little bit. 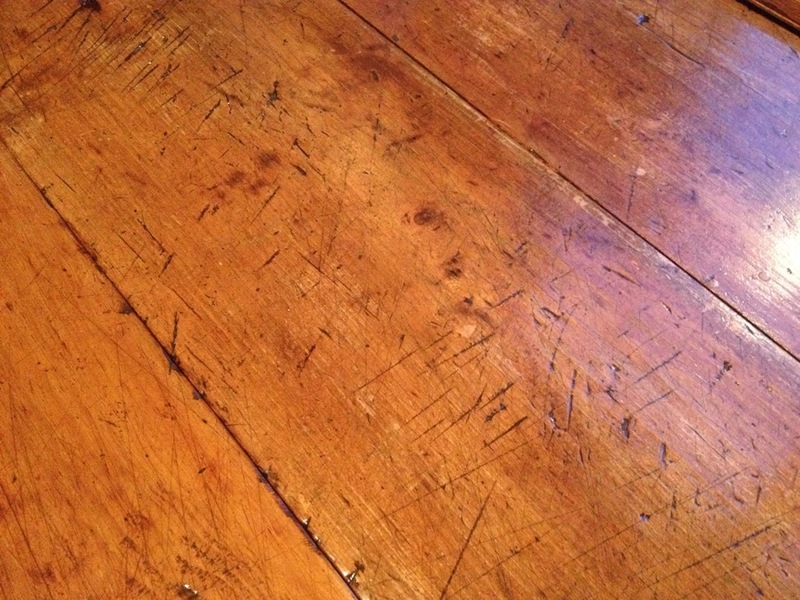 The table legs are made out of oak, and judging by all those crisscross cuts were probably used to parry the broadswords of viking invaders. 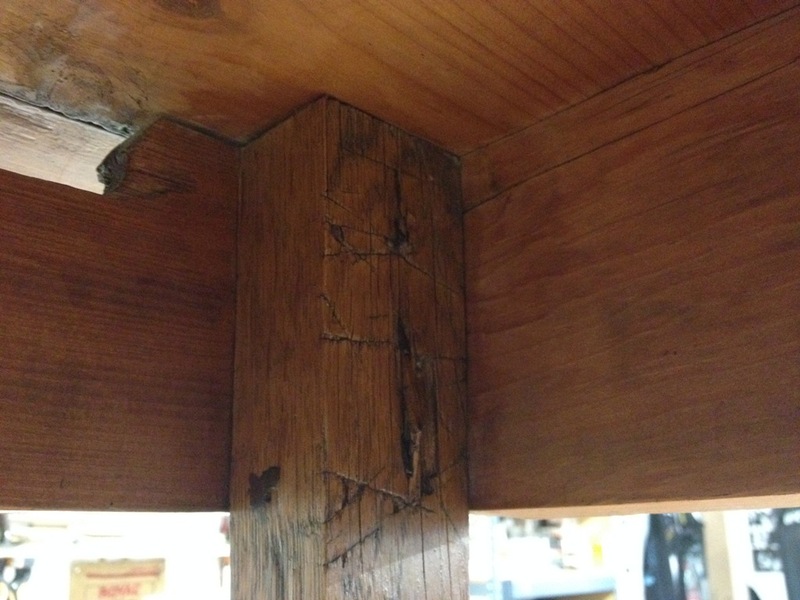 No effort was made to remove the splinters on the exit side of all those nails. All I had to do was slather on some polyurethane, just trying to make it a little more sanitary, that’s all. 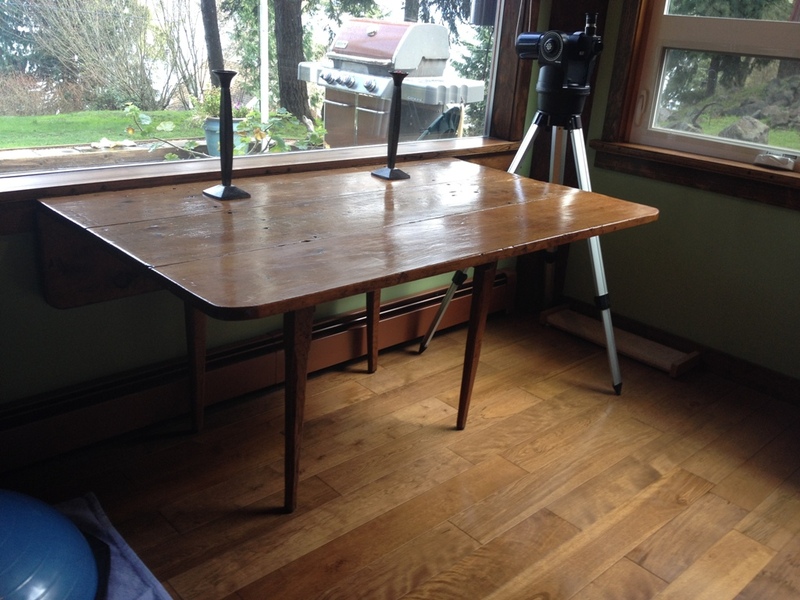 This table is now in its final resting place. You can’t get this at Restoration Hardware. No sir.